Pearl rice is sweet, sticky and like other types of rice, it can be long- or short-grain, processed or unprocessed. Its taste and texture, both common characteristics of glutinous or starchy rice, makes pearl rice a good choice for sushi, rice pudding and a number of oriental main-dish meals. Everything is different when it comes to cooking this type of rice. Special handling, utensils and cooking methods are necessary to make sure pearl rice turns out firm and chewy and not soft and mushy. Add enough water to a steamer pot to create a depth of 1 1/2 inches. Set the steamer insert, or rack, in the pot and bring the water to a full boil on your stove top. Drain the soaking water from the rice and empty it into a wire mesh colander or the top portion of a bamboo steamer. Set the colander on the steamer rack, cover the pot and steam the rice for 30 minutes. 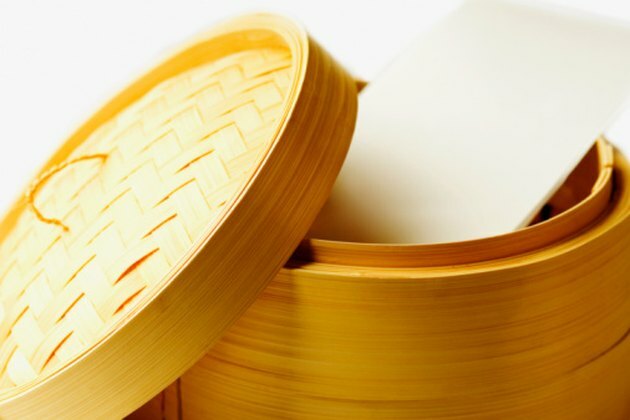 Although a common vegetable steamer will work, a bamboo rice steamer works best for cooking pearl rice. If you steam less than 2 cups of pearl rice, you also can steam the rice in a shallow dish rather than a bamboo or wire mesh colander. Brown pearl rice has a less sticky texture. Because it includes the hull, it requires about 15 to 20 minutes longer to steam. You may find instructions that tell you to first line a vegetable steamer rack with a damp cloth and then add the rice directly to the rack. Avoid this method because it allows the rice to absorb too much water and increases the chance your rice will become mushy during cooking.